For all that she is the most famous woman of the medieval period, Eleanor of Aquitaine remains an historically elusive figure. 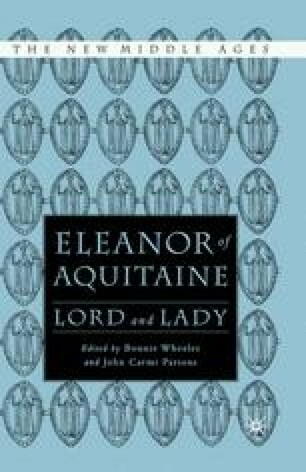 Much earlier scholarly literature was preoccupied with her personal life, casting her as the unfaithful wife of her first husband, Louis VII of France, or the jealous and scheming wife of her second, Henry II of England.1 Recent studies, like those in this volume, suggest a new image of Eleanor of Aquitaine as a politically astute woman, an image independent of romance novels or memories of the magnificently aging Katharine Hepburn. This new work has come chiefly from historians who have examined the whole range of extant documents for Eleanor’s career, not only the chronicles of the day or Louis and Henry’s official charters, in which she figures very little.2 To join these unsentimentalizing reappraisals, I will reconsider here Eleanor of Aquitaine ‘s relationships to the Angevin/Aquitanian tombs at Fontevraud Abbey: those of Henry II (d. 1189), their son Richard I (d. 1199), and Eleanor herself (d. 1204). Eleanor of Aquitaine, in the tradition of queens controlling burial sites and monuments, commissioned her family tombs at Fontevraud, drawing from a lifetime of experience with royal funerary customs.